Planer blade sharpening information & recommended planer blade sharpener products. Includes video on how to sharpen planer blades & written guide to sharpening plane iron blades. Applicable to planer knives & blades. When sharpening a new plane blade you are going to need to flatten the face before you sharpen the bevel. This is done by lubricating an extra coarse diamond bench stone (Diamond Whetstone™, Duo-Sharp® & Dia-Sharp® models available) with water and placing the back of the plane iron blade down on the sharpener. Push downward on the face and move the planer blade from one end of the diamond stone to the other with long fluid strokes (see illustration below). Now we're ready to sharpen the bevel of the planer knife. Put your thumbs under the blade and your fingers on top (see the video below for an illustration of this). Using your hands in this fashion gives you a makeshift jig. Make long fluid strokes back and forth, pushing the plane blade downward onto the stone. 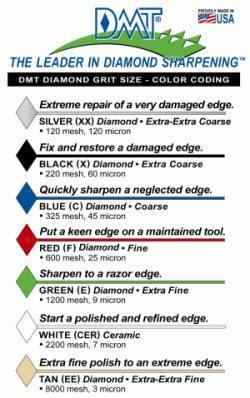 Use a fine grit diamond sharpening stone unless the blade is very dull or chipped, in which case start with a coarse grit. After sharpening the bevel you may want to put a micro bevel on the end of the blade. This is done by holding the plane iron blade in the same manner and matching the bevel to an extra fine stone. Now lift the planer blade up a small amount to an angle of about 1 or 2 degrees greater than the bevel. Only a few strokes and you have a sharp micro bevel. If you have any questions about sharpening planer blades then please don't hesitate to contact us.